The Day the Elves won the Lottery: Strictly for the broadminded. 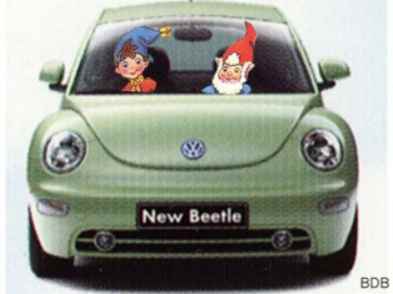 The new Volkswagen Beetle's First Proud Owners: With apologies to VW. An Answer to the "gry" Riddle: Just in case you really care. Built-in Orderly Organized Knowledge device: To show the young generation what used to happen. Portable Erasable Nib Cryptic Intercommunication Language: An old fashioned keyboard. Book Inscriber Rather Ordinary: A rather more up-to-date old fashioned keyboard. Comprehensive Universal Pot: With which to sustain yourself whilst using the above items. Romeo and Juliet: Will this have Will turning in his grave - or will Will be amused? Taxis: Road reports on the up-coming new means of public transport in South Africa. TENDJEWBERRYMUD: If you don't get this one, don't email us!